Want to create a Facebook business page but not sure where to start? Then keep reading as we share some top tips and step-by-step instructions on how to create a Facebook page for your brand. To create a Facebook business page, navigate to https://www.facebook.com/pages/creation. Then select Business or Brand. Next, give your new page a name, choose a category for your page, and add an address. Now upload a profile picture and a cover photo. Depending on your business, your profile picture may be an image of you if you are the face of your brand, or it can be your company logo. Add a Short Description – Help visitors to your page immediately see what you are about with short description of your business. These couple of sentences also appear in search results when people search for your business. 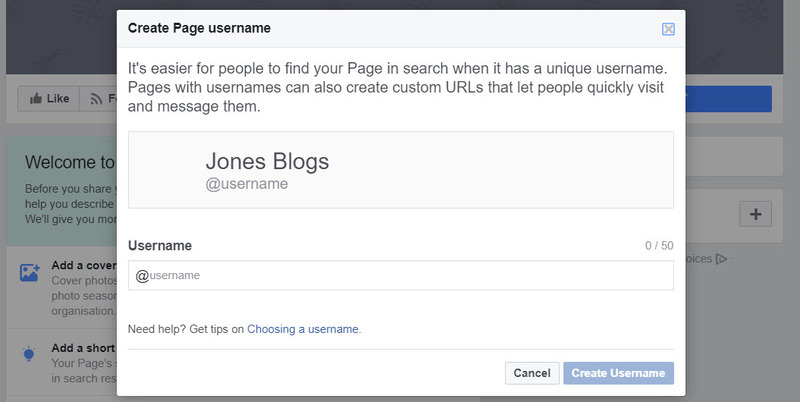 Create a Username for Your Business Page – By creating a username, your page will be given its own custom URL (eg www.facebook.com/jonesblogs), helping people to quickly find your page. Add Your Website Address – Drive traffic to your website by displaying your website address in a prominent position on your page. Add a Button – Facebook lets you display a call-to-action button near the top of your business page. You can choose the action that you would like your audience to make on your page. The options vary from driving traffic to your site, phoning your shop, or downloading your app. This button is then visible in search results relating to your page. After completing the above tasks, you will have a basic Facebook page that is ready to go. Next, you need to start considering what content you are going to post. In January, Facebook announced a change to the Facebook algorithm, with a new emphasis on friends and family. 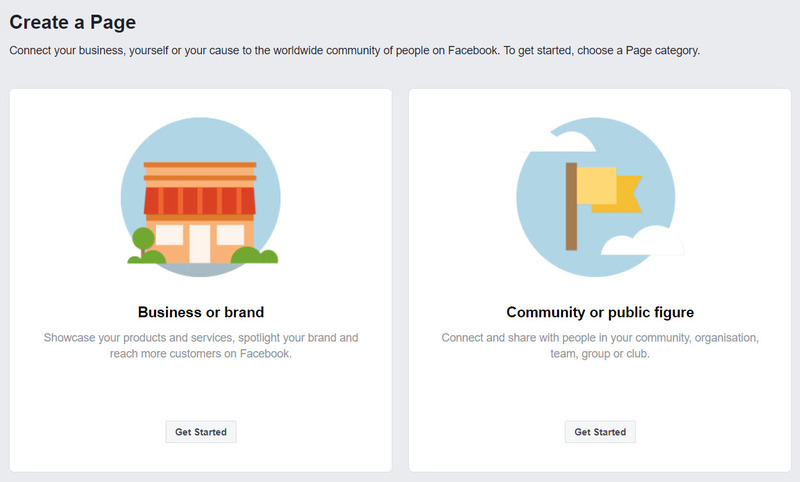 Whilst this is great for all individuals using Facebook, it isn’t so good for brands. 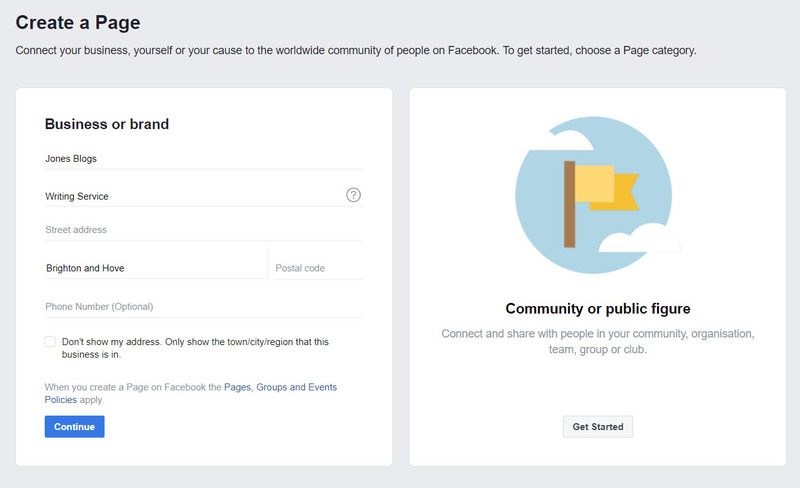 As there is limited space on news feeds, Facebook has said they will ‘show more posts from friends and family… and less public content, including posts from publishers or businesses’. This doesn’t mean that your Facebook page posts will never reach your followers. Just that it may be harder to achieve. The advice Facebook has given is that they will ‘prioritize posts that spark conversations and meaningful interactions between people’. There has been an explosion in video over the last few years across all social media platforms, and Facebook is no exception. If you want to connect with your audience and get your followers commenting and sharing your content, then using video is key. Facebook Live – Talk to your audience through live video, answer questions as they are asked, and enable followers to build that much needed personal relationship with your brand. Facebook 360 – Share immersive stories, places and experiences through captivating 360-degree videos. Live 360 – Let your audience feel like they are right there, living moments and experiences with you through 360-degree live videos. GIFs – Have fun with your audience and boost engagement by sharing GIFs on your Facebook page. Looping Videos – If your video is under 30 seconds long, Facebook will make it automatically loop continuously. This is a great way to grab users’ attention and drive home the point you are making in the video. By posting content via a number of different video formats you can help ensure your content stays interesting but still achieves those ‘meaningful social interactions’ that the Facebook algorithm is said to favor. Engagement bait is an easy way to encourage your audience to comment and share your content. However, Facebook has now stated that it is clamping down on this behavior. And you could even find your Facebook page penalised for posting this type of content. 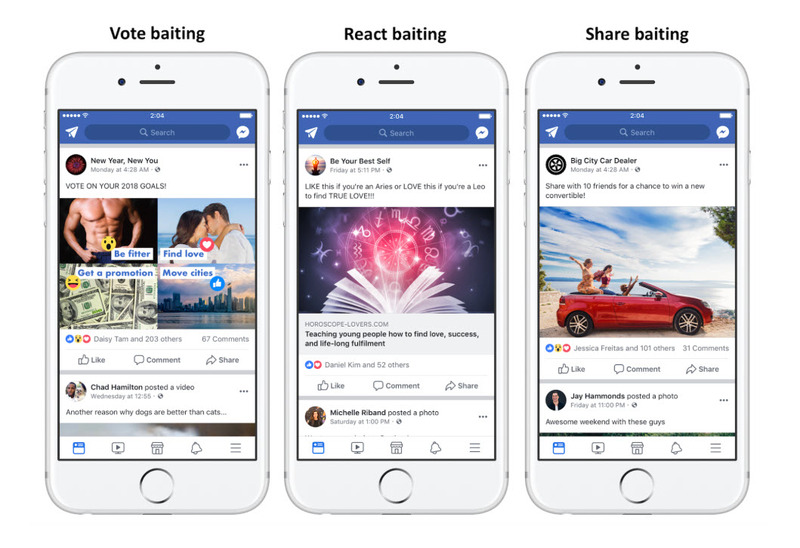 So what is engagement bait? ‘LIKE this if you have that Friday feeling’. ‘SHARE this post to win a free holiday’. ‘COMMENT ‘yes’ if you love dogs’. In the past this type of content has been a great way to boost engagement and reach a wider audience. But Facebook pages that continue down this line will now see a ‘significant drop in reach’ for these posts. Therefore, creating authentic content that focuses on relevant and meaningful stories is the way forward for businesses and brands on Facebook. Facebook Messenger is integrated with your Facebook page, and with more than one billion people using this service every month, it is an important tool. By turning on Facebook Messenger, your audience can easily connect with you on a one-to-one. 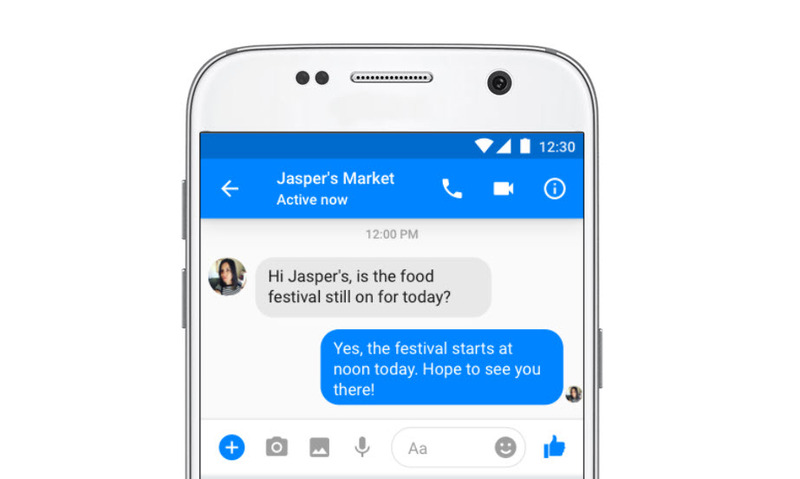 Through Messenger, people can ask questions, give feedback and discuss any issues relevant to your business or service. This will help you develop personal relationships with your audience, and produce loyal followers. YouTube – On your YouTube channel you can add a link to your Facebook page, which will be overlayed on your YouTube channel art (the featured image). You can also add calls-to-action in your channel’s description, and on video descriptions. So make sure you take advantage of this and ask your viewers to follow you on Facebook. Instagram – The only place you can add a link on Instagram is in your Instagram bio. If you are having a big push to try and grow your Facebook following, change the Instagram bio link to your Facebook page URL, and add a call-to-action promoting your page. Twitter – Tweet out about your Facebook page, share the link, and make it quick and easy for people on Twitter to find you on Facebook. Remember that cross promotion does not mean cross-posting. Make sure the content you use on each of your social media channels is unique and relevant to that specific channel and audience. Getting your website visitors to follow you on Facebook will help you to keep in contact with your target audience once they have left your site. Using a conversion popup on your WordPress website is an effective way to achieve this goal. Sumo is an impressive lead generation tool that will enable you to add a Facebook follow popup to your WordPress website. Simply sign up with Sumo and install their plugin. You can then use the Sumo List Builder to select from a number of attractive popups, customize the design and message, and choose when and where the popup will be displayed. Again, by making it easy for your website visitors to find your Facebook page, you will increase the number of follows you receive, quickly growing your Facebook audience. It is not enough to just create a Facebook business page and keep adding content. You need to know what content is resonating with your audience, who your audience is, and what actions are being taken on your page. By being well informed about how your audience is engaging with your business on Facebook, you can create a content strategy to further grow your Facebook followers and increase interaction on your page. Reach – See how many people saw your posts, as well as liked, shared and commented on them. Page Views – Find out how many people are viewing your page and what sections they are engaging with. Posts – View a breakdown of how each of your posts are performing over time. Actions on Page – Discover what actions people are taking on your page. This includes whether they are visiting your website and if they are clicking on the call-to-action button. People – Learn about your audience with information on their age, gender and location. You can also see when people are viewing your page and how they are finding it. As you can see, Facebook Insights contains some extremely useful data. 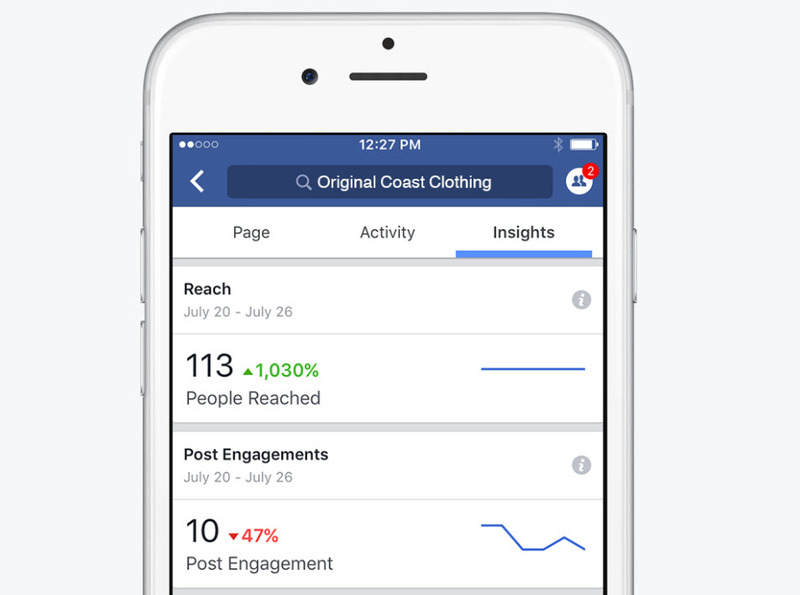 To access this information simply click on Insights, found at the top of your Facebook page. By following the step-by-step instructions above, you will find it is extremely easy to create a Facebook business page. It is producing engaging content and growing your following that will take much more time and effort. However, the long term gains of a successful Facebook page is well worth the endeavor. Good Luck! 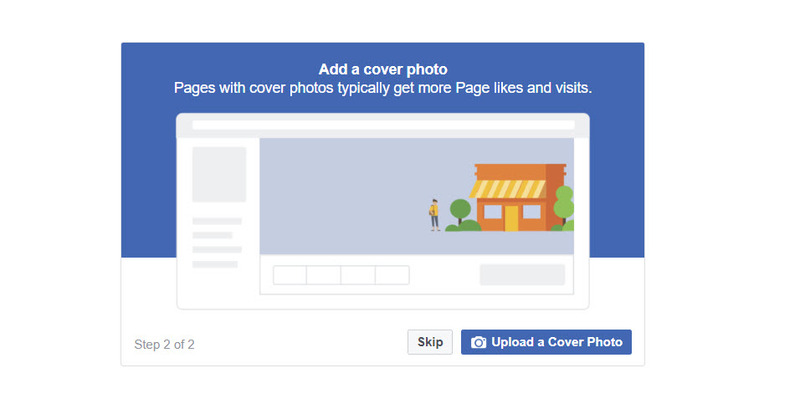 For more tips on how to create a Facebook business page check out our article 6 Facebook Business Page Tips You Don’t Want to Miss Out On. The post How to Create a Facebook Business Page that Encourages Engagement appeared first on Revive Social.